The Standard F40 Bookletmaker is the perfect entry-level unit for automated in-house booklet making for smaller shops and organizations. The set-up and operation for this machine is straight forward and easy to use for all of its users. The four staple head positions offer maximum flexibility for a variety of different booklet sizes. 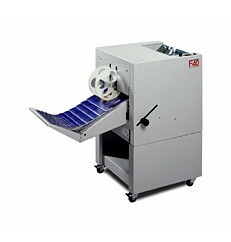 The Standard F40 makes booklets as small as “CD” size to larger than 11” x 17” at 1500 booklets per hour and can easily staple and fold up to 25 sheets of 20-lb. paper. The F40 can also function as a corner/side stapler both as a stand-alone as well as in its in-line configuration. The soft rubber folders handle a wide range of stock without marking on the documents. The Standard F40 is a low cost-high value booklet making system that can be a compact table-top unit, or you can add a stand for a free standing operation. The Standard F40 has an optional exit conveyor with adjustable speed control and an integrated collator interface that allows the user to set release points and tail jog with an on control knob. This Bookletmaker comes standard with 2 stapling heads, a counter, an automatic release, and a side jogger. However, an electronic release for link with collators, adjustable electronic delivery conveyor, catch tray, and a storage cabinet/stand are available for purchase. If you have any questions or are interested in purchasing the Standard F40 Bookletmaker, visit us at SpiralBinding.com. We also have great pricing on a full line of Booklet Maker Systems. Call us at 1-800-631-3572 for more information.